Getting here was a chore. We were broke down in a small town in southwest Bulgaria at a nice hotel. I rented a car, a real clunker of a diesel Renault. It doesn't look too bad here, but the seats are ripped, the clutch weak and there is no key. Too start it one flips a secret switch under the dashboard and pushes the big green button beside the steering wheel. No rental agreement, in fact no paperwork at all, just pay 50 Lei (about $35) and away I go. I take our alternator to a shop and the guy took it apart, replaced a part and said he fixed it and charged me 50 Lei, but it still didn't charge the battery when I put it back in. So I got online and found the phone number for the founder and president of the GoldWing Club of Greece (the nearest GoldWing club). 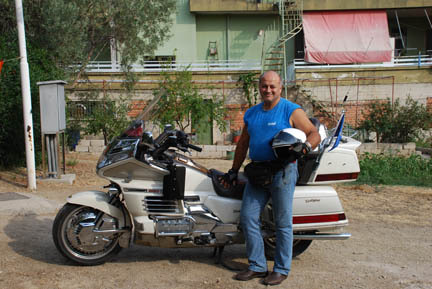 His name is Lefteris and he is glad to help and will send an alternator to a shop in Thessaloniki, the nearest city to us. So we wait four days for it to get there. Meanwhile we are having terrible thunderstorms in Bulgaria. Trees down, torrential rain, thunder and lightning and power outages. We are not relaxing beside the pool and taking the sun, we are in the room hiding out and watching movies on HBO, mostly in English with Bulgarian subtitles (when the power is on). 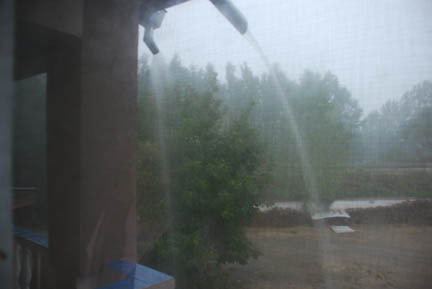 This is the two downspouts outside our window. 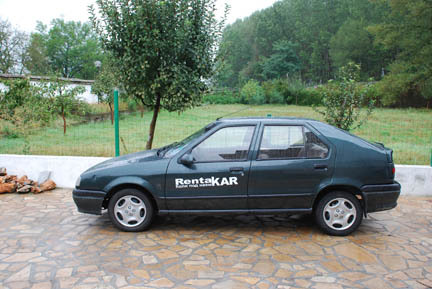 Finally we rent the car again and head to Thessaloniki to get the alternator. It is 60 km. over the mountain and 100 km. across the border into Greece. We miss a corner in a small village and spend an hour getting back to the correct route. This far in the back country of Bulgaria and the road signs are in Cyrillic script without English translations. We can't read them and are guessing at each intersection which way to go. We are also afraid of being stopped at the border for no paperwork on the car but they never asked. We had looked up the address of the shop online in Google Earth because our GPS mapping does not include this city. We saved screen shots of the area and took the computer along to use them as maps. Eventually we did find the shop. After getting the alternator we headed back to the border and over the mountain to the hotel. We spent 9 hours on the road and get back just before dark. We start replacing the alternator right then and it begins to rain again. So we cover everything up and head inside. The next day we finish, pack the bike and get ready to leave. The engine won't turn over. We have water in the cylinders and have to pull the spark plugs and blow it out (this also happened once in Germany in several days of heavy rain). Finally we get started and headed for Greece, back over the mountain again and to the border. This time we are asked if we have insurance for Greece, we prove we do and are let in again. We have exited Bulgaria, entered Greece, exited Greece, entered Bulgaria, exited Bulgaria and entered Greece all within 36 hours. Lots of stamps in our passports, but we are on the road again. After two days on the road we are in Athens at the campground on the west side of town (the only one). We call Lefteris again and tell him we are in town and he comes to the campground and meets us. He is a very jolly guy. He has a wife, four kids and two GoldWings and ready to help. We have had an intermittent problem with the fuel pump for a month now and he says that we should take the bike to his friends shop. So he and I head off through traffic and narrow roads to the shop where the mechanic will add an auxiliary fuel pump. (Following the locals through strange cities with heavy traffic is always exciting!) It is a small shop, but there is another Wing in it being rebuilt but it seems to be quality work so I have great hopes. It is late Friday and we can pick it up Monday afternoon. By then the new alternator Lefteris ordered should be here and I can give him back the one out of his second bike. Over the weekend we go see the sights of Athens. 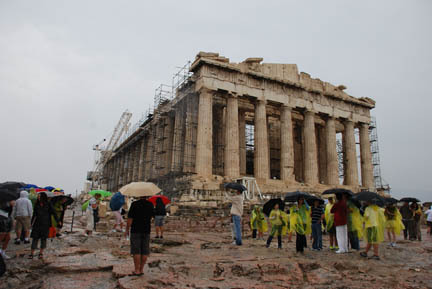 First is the Acropolis with its temples and the Parthenon. Yesterday's sun is gone and we have wind and rain. But the site is amazing. There have been temples on here for about 3,000 years. These date from the 4th and 5th centuries BC, the time of Athens' power. The ground is not dirt, it is a marble rock that has been sculpted and flattened as needed. Even though most of the buildings were heavily covered in scaffolding and we were not allowed in any of them, they are awe inspiring that that many huge rocks could be moved up here, carved and stacked so beautifully. And the tour groups were out too. In dry weather they are bad enough, taking over areas, blocking paths, and generally getting in the way with their leaders shouting in a variety of languages. When it is raining and they have their umbrellas out they are downright dangerous. They have no consideration for individual travelers and you can get poked and hurt by the umbrellas as they move en mass from place to place taking each over as if they owned it. 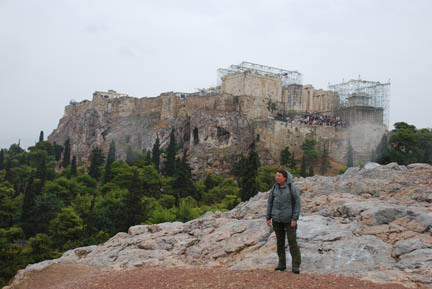 From there we walked over to a nearby rock called Areopargus Hill (another marble outcrop) and looked back at the Acropolis. 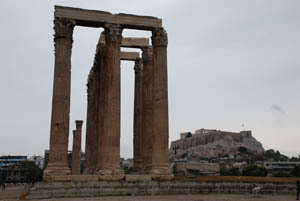 It stands up tall and can be seen from nearly everywhere in Athens. And then we continued down into the Ancient Agora, a business and shopping area on the other side of the Areopargus Hill. The most complete temple left from this period is in here (left center in the picture). The modern city is just beyond the Ancient Agora. 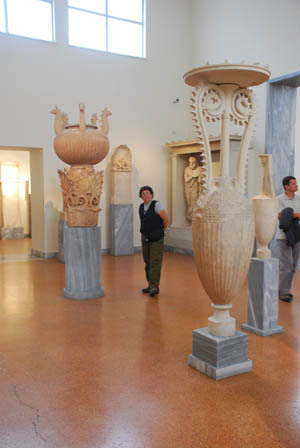 In the Ancient Agora was a museum with a very interesting artifact. 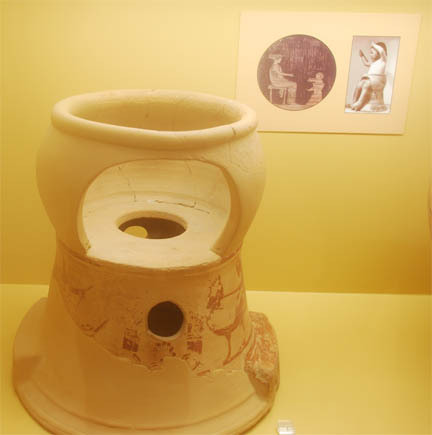 It seems that the ancient Greeks had the same problem that parents have everywhere today, potty training the youngsters! The picture on the wall shows it in use, both as a drawing of it in ancient Greece and a photo of a child in it in modern times. 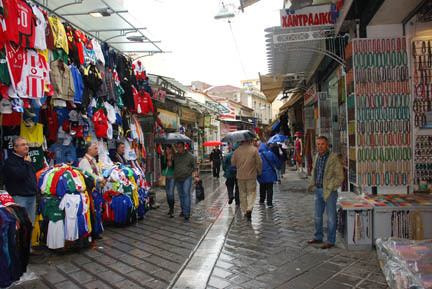 Continuing through the Ancient Agora we came onto a warren of narrow lanes of souvenir shops and cafes known as Monastiraki. We bought some postcards and a couple inexpensive souvenirs. And just wandered and looked at the shops and people. 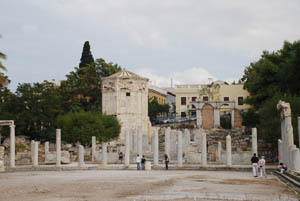 Eventually we worked our way around the Acropolis and went to Hadrian's Gate and the Temple of Olympian Zeus. 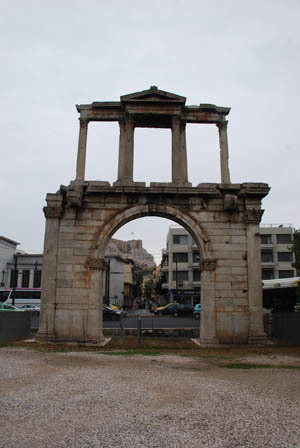 The Roman Emperor Hadrian (the same guy who built the wall in northern England) built the arch on the left and wrote on the west side "This is Athens the ancient city of Theseus." and on the east side "This is the city of Hadrian and not Theseus." Just behind the gate was the huge temple dedicated to Zeus (the Acropolis is in the background of the picture). Only a small part of the temple is still standing. We went back to camp to find our sleeping bags had gotten wet. We asked the campground staff to let us use the dryers in the laundry to dry them and they said no. We had used the laundry the previous day and knew they would work but we were not allowed to use them for some reason. So we put on our jackets and riding pants, doubled our socks and spent a miserable night. Trying to sleep here is bad enough, there is an eight-lane major boulevard in front that is extremely busy all day and night. Trucks, buses, cars and motorcycles are roaring by at all hours. We sleep with ear plugs but that only lowers the noise not end it. On Sunday we went to the National Archaeological Museum where many of the treasures excavated from the Acropolis and the Agora are to be found. There are artifacts dating to the Neolithic (6800-3300 BC) and Mycenaean (1600-1100 BC) eras as well as the Greek (500-400 BC). 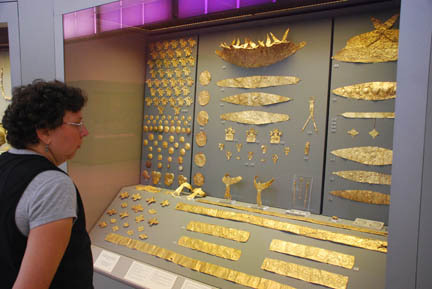 There was a lot of finely worked gold from the Mycenaean time. 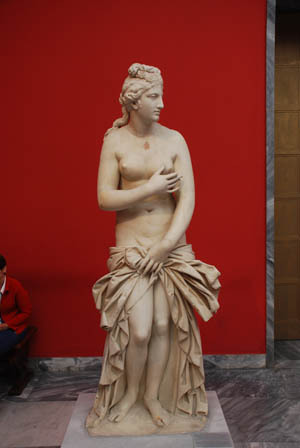 And a statue of Aphrodite and some funeral urns from the Greek time. There were many more statues of various gods and people. And there were halls filled with the red and black pottery that was their everyday cooking and storage ware. It was a very interesting museum devoted exclusively to their own culture. From there we walked to Hadrian's library and the Roman Agora. These two huge buildings sat side by side but today have a couple modern city blocks between the ruins. 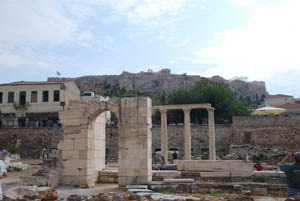 The library (left) has the Acropolis in the background and the Agora (right) was a shopping mall with an astronomical tower at the back (left of center). It told the time and wind direction as well, with each face of the eight-sided tower a different symbol for each wind. 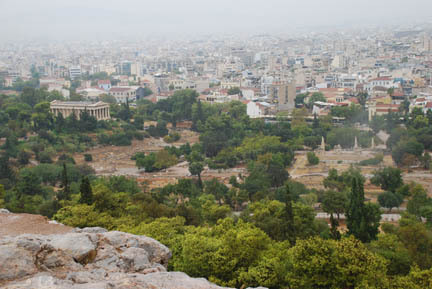 There is so much history here buried under the modern city of Athens that almost any excavation unearths more ruins. 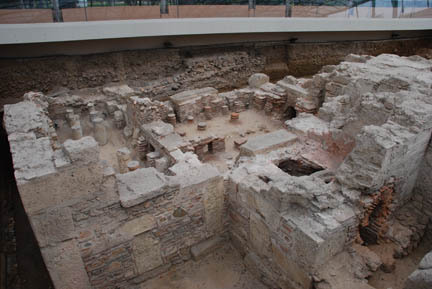 Here is a Roman bath, not far from Hadrian's Gate, that was uncovered when they were digging a vent tunnel for the underground metro system (which is below most all ruins). Scattered around the Acropolis are several sites where an excavation revealed a ruin and it is now protected by a roof and open for viewing. The reason for the excavation either moved (like the vent tunnel) or halted. Athens' ruins have been more interesting than Rome's ruins. Maybe because we know less about them in advance or perhaps they are more variable. The Acropolis is much more interesting than the Coliseum in Rome (which we found disappointing even at the time). It has been a good couple of days, even with the rain on Saturday. From here we go on to more of Greece.